Can your students Make 10? Then have them Subtract from Ten!! 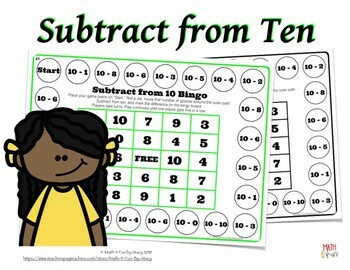 These game boards are an engaging way to help students develop their subtraction strategies for taking from ten. 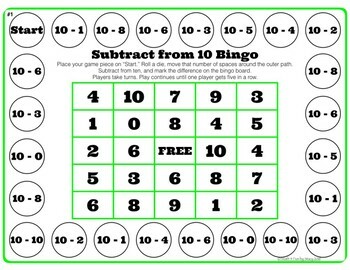 These game boards are for students who can subtract from ten without the use of visuals (numbers only). This set includes six game boards in color, and the same six game boards in black/white for ink saving printing option. These game boards can be used in math centers, in a small group with the teacher (guided math), or with partners for fluency. For game play, students will roll a die, move around the game board and find the difference when subtracting from ten.